For decades Southerners were trained to distrust and dislike Yankees, by which was meant anyone raised anywhere outside the eleven Confederate states. So, like most Southern kids of my generation, I was instructed in the Dixie catechism, which varies only in that each family has its own tale of why the Civil War is personal. Here’s mine as passed down from my maternal grandmother. Her grandfather, Nevil, fought in the Fourth Alabama Cavalry. Somewhere in Tennessee in 1863, he was commanded to transfer a couple of captured Union officers to Georgia. Along the way, the Yankees got the upper hand. Wresting away Nevil’s gun, they shot and killed him. But wait, the story doesn’t end there…. The letter writer states that he is one of the Union soldiers that Ben’s father was transporting to Georgia, and that it wasn’t until after he had shot him that he noticed the Masonic ring on his finger. He writes that he would never have killed him had he known he was a brother Mason, and that the killing has haunted him every day since. He closes the letter without signature but with great remorse and the desire that, somehow, by God’s grace, Ben will forgive him. Ben takes the ring from my grandmother, examines it closely, then looks again at the envelope. Grandmother’s mom, Molly, has been watching and listening. She asks if the letter is postmarked. He’s not kidding. A few years later, he will murder a man for insulting his eldest daughter, and, a few years after that, he will be murdered himself. This is rural Alabama dirt-farmer Southern code, and Yankees, especially, are not exempted from due justice. This story reached me when I was barely older than my grandmother had been when the letter came to her father. The tale had, however, lost some of its desired effect because I responded with, “That poor Yankee man, feelin’ bad all those years.” Oops. Error on my part. That “poor Yankee” [two words that must never be placed side-by-side!] killed Grandmama’s granddaddy. How would I feel if a Yankee killed my granddaddy? This was a war of Northern aggression. We didn’t attack them. They attacked us! Don’t let anyone tell you the Civil War was about slavery. It was about states’ rights. Besides, our slaves were treated well and respectfully. Most of them didn’t want to be freed. Forget, hell! 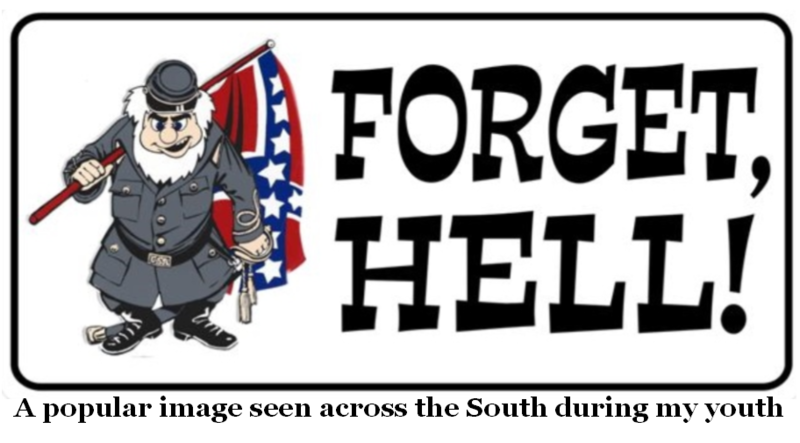 We owe it to our fallen ancestors to stand up for the Confederacy. The South’s gonna rise again! I started reading lots of history books and learned that what I’d been told and what had happened were often radically different. Then I made my biggest mistake: I opened my mouth about it—in the South.